One of the biggest drawbacks of using bar soap is its potential to become a soggy mess during the course of its usage. If soap isn't allowed to dry thoroughly, it eventually dissolves and melts away into a messy soap puddle. Fortunately, it's easy to prolong the life of your bar soap and keep your washing area cleaner for longer. 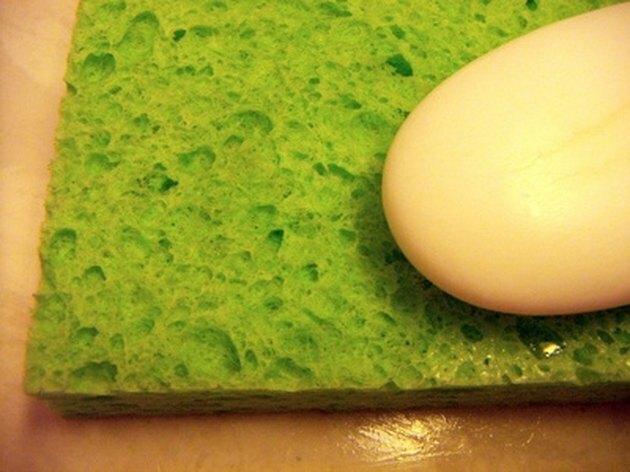 Keeping a sponge underneath your soap helps to absorb moisture and reduce sogginess. Select a soap dish with slats, holes or a drainage spout to allow excess water to drain from the bar of soap. Soap becomes soggy when it is unable to dry out so purchase a dish that elevates the bar or permits the water to run off. Place a sponge in your soap dish, underneath the bar of soap. The sponge will absorb the excess soapy liquid, leaving your bar of soap dry and free of sludge. Be sure to rinse your sponge regularly. Choose soaps that are naturally harder or denser in texture. French milled or triple-milled soaps tend to be harder soaps, making them more resistant to melting and breakdown. Place unused soap between two sheets of linen fabric. Put this bundle into a dark drawer and allow the soap to remain for at least one week. This will "cure" the soap, causing it to become harder and less likely to melt once ready to use. Wash your soap dish once a week in a dishwasher. The heat and detergents will kill bacteria and clean the scum from the dish, which will help to prolong the life of your soap.